The New York Islanders are one step closer to being nudged off the Island and cast adrift - but Brooklyn fans stand ready to hoist them back in. 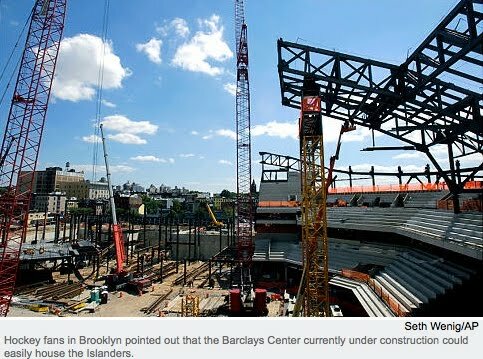 Kings County hockey lovers jumped at the idea of having the team share the Nets' Barclays Center at Atlantic Yards. The article quotes three Brooklyn hockey fans, and one downer from Long Island. Patrick Hickey Jr., 28, from Bensonhurst, said the success of the minor league Brooklyn Aviators is proof that Brooklynites embrace hockey. He added that Madison Square Garden successfully juggles hockey and basketball. "MSG can do it. 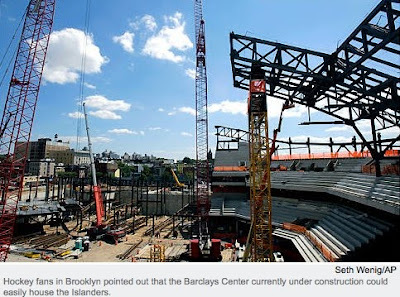 Barclays is going to be newer. It's going to be higher-tech. Why can't they do it too?" Hickey asked. Unmentioned: the Brooklyn arena was consciously redesigned to save money and focus on a very tight bowl for basketball, a fact unmentioned in the article and the caption (above). To accommodate hockey, there would be bad sightlines and only about 14,000 seats--suboptimal. There still may be a financial argument--the Islanders' cable deal, but that's still a question mark.